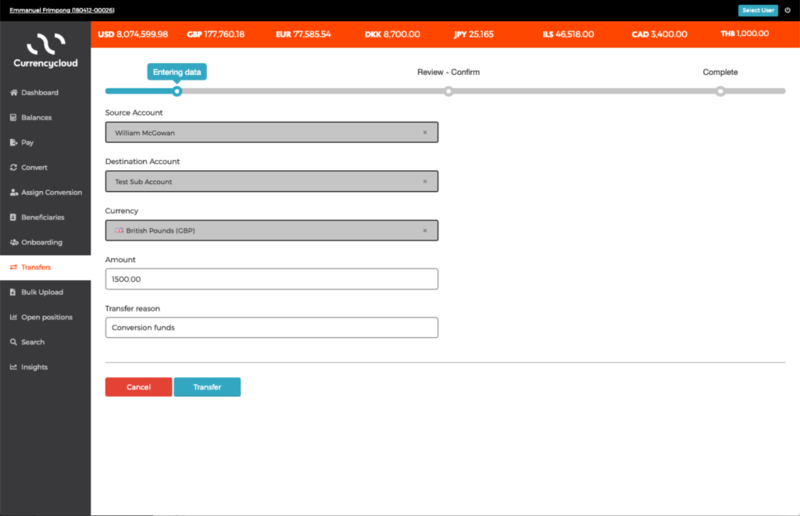 Transfers is available to clients that use the Balances feature, i.e. have the wallet functionality enabled, and have Sub-Accounts set up on their Currencycloud Account. For integration with our Transfers API, visit our Developer Center. See below for further information and if you have any questions, please contact us at [email protected] or speak to your Relationship Manager. Using the Transfers page, you can move funds from your own account to one of your Sub-Accounts or the other way around, or even between two of your Sub-Accounts. After providing the required information, you can review the transfer before submitting it. 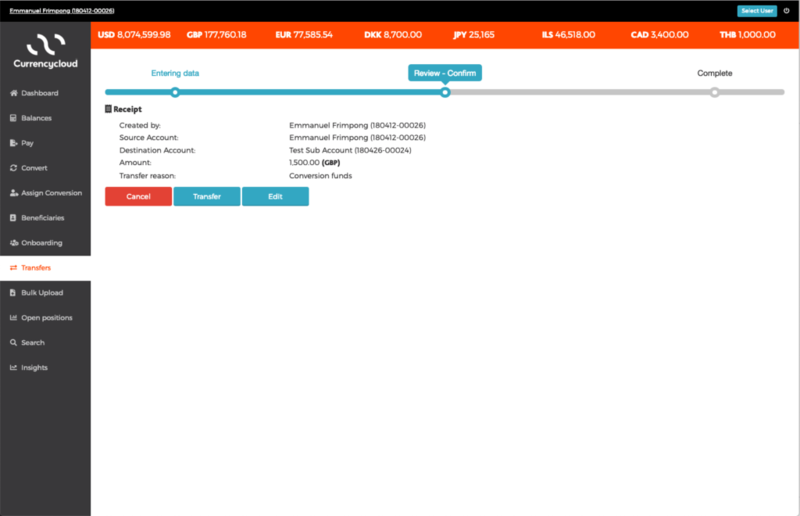 After submitting the transfer, the transfer details are shown on the screen for the user. 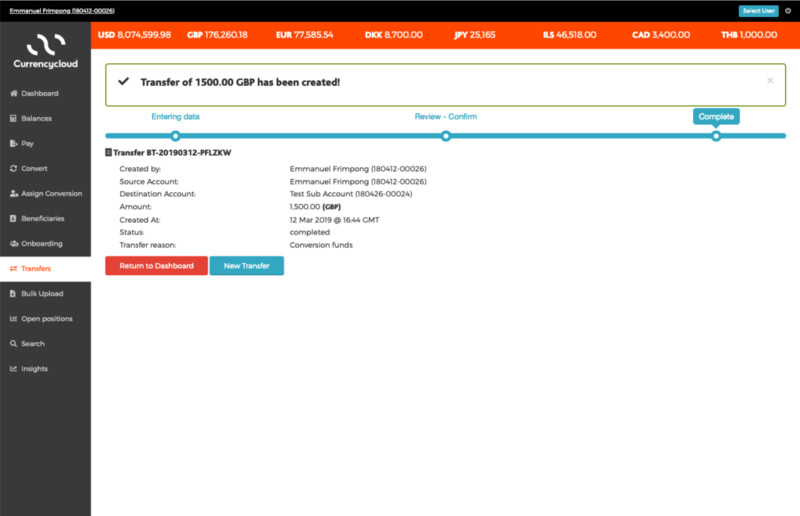 This transfer will also be visible on the Currencycloud Account balances through Direct. Transfers are executed immediately when instructed if there are sufficient funds in the source account balance. Transfers are placed in “pending” status when there are insufficient funds in the source account balance; the transfer is created and remains in “pending” status until sufficient funds are provided. Transfers are prioritized and processed before conversions and payments in the execution order. All the transfers that have been submitted can be found on the Search page under the “Transfers” tab. By clicking on a specific transfer, a pop up with the transfer details is presented.